Making the leap from preschool to primary school is a huge milestone for every child. Even though I'm not new to the how everything works - from registration and orientation to recesses and routines - since the firstborn is in Primary 3 already, I have to remind myself that it's a big change for Ariel who is going to make her transition very soon. While she seems to be mostly excited about it, I am pretty sure she feels the jitters too and can't help but wonder how she will adapt and fit into the new school. Having learnt from experience in the past three years, one of the things I can do as a mum to help ease her transition is to make her feel eager and positive about the change. For starters, since I'm in the parents support group committee, I've been bringing her with me to school to let her get familiarised with the surroundings. She knows how to get to the main gate, she has tried buying her own food from the canteen, she can make her way to the general office and she has a concept of how things will work differently in the new system. We will also be attending her P1 orientation together this week so that she can get acquainted with her form teachers and classmates, learn about the school rules, receive her book list and try out her new uniforms too. 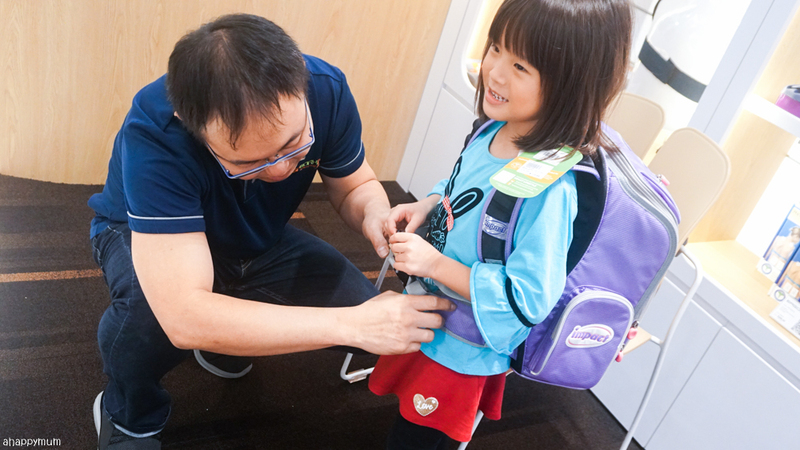 Another important step in preparing her for Primary One is to get a new school bag - not just any school bag, but a quality one that will make her feel comfortable and last through the years. I believe in investing in a slightly more expensive, ergonomic school bag in this case because I've learnt that no matter how hard the child tries to follow the timetable and pack a light load, the truth is my firstborn always seems to be carrying a rock to and fro school and it scares me to think of how it can hurt her spine over time. I'm not the type of mum who will offer to carry their school bags so they will have to be able to do it themselves. Also, since the elder sister walks home from school on her own and I have every intention of letting the little sister join her in doing so, that means I will want to feel assured that I have done my best in trying to instill good postures, maximise comfort and reduce stress by getting a good ergonomic school bag for them. 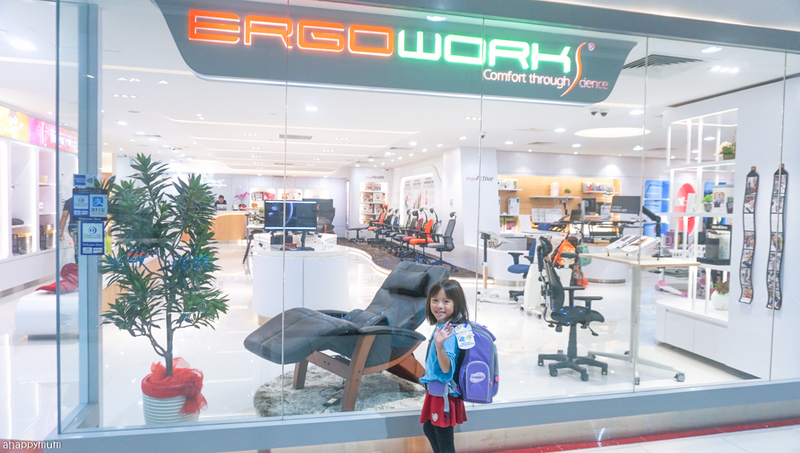 In this post, I'll be sharing with you about Ariel's new IMPACT school bag and our shopping experience at ERGOWORKS where we learnt a good deal about how ergonomic products can make a difference in our kids' lives. 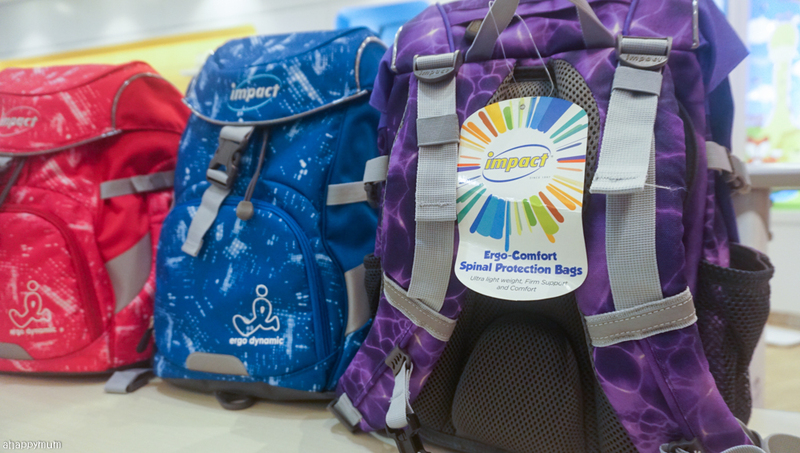 For those of you who would love to get a new school bag for your child too, I'm giving away not one, but TWO brand new IMPACT Air Light Spinal Protection Backpacks worth $169 each. Read on to the end for more details on how to participate. 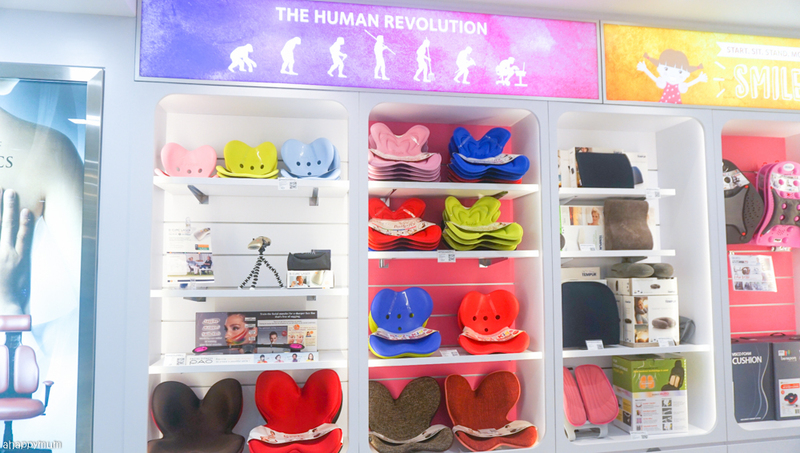 We visited ERGOWORKS' flagship outlet at Marina Square (#03-140/141) which spans over an area of 3,000 sqft and looks not just spacious, but welcoming too. There was more than ample space for the kids to roam around and while Ariel was choosing her school bag with me, the baby brother was sleeping peacefully in the stroller which I tucked away in a corner and the big sister was delighted to start reading a book she saw at the ergonomic tables and chairs section. 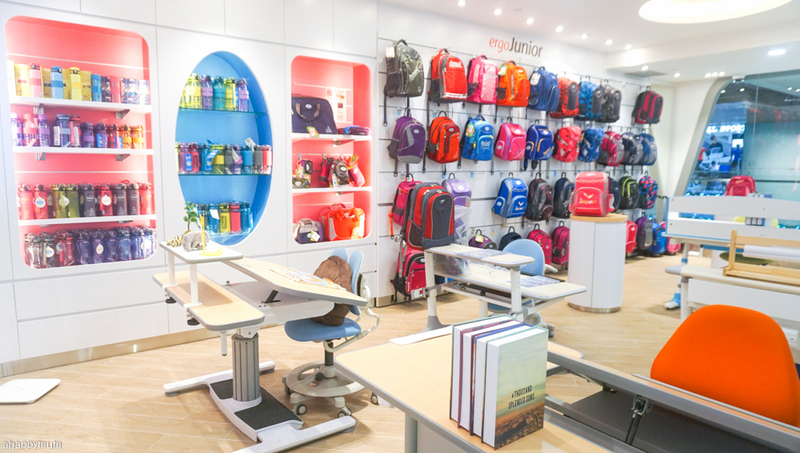 A big reason why we were drawn to this place was because of the vibrant, multi-hued school bags which were hung neatly on the wall, as well as all the colourful, striking accessories and products. Ariel's reaction was "Wow, so many nice bags to choose from!" and couldn't wait to start picking out the designs that appealed to her. For your convenience, you can also find other ERGOWORKS outlets at Centrepoint (#03-36) and Causeway Point (#03-26). 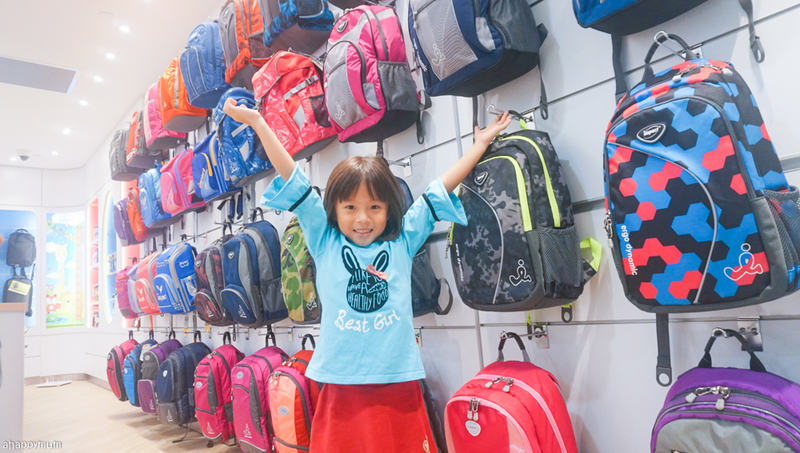 Let's take a closer look at the range of school bags you can find at the Marina Square outlet and which were our favourite picks. 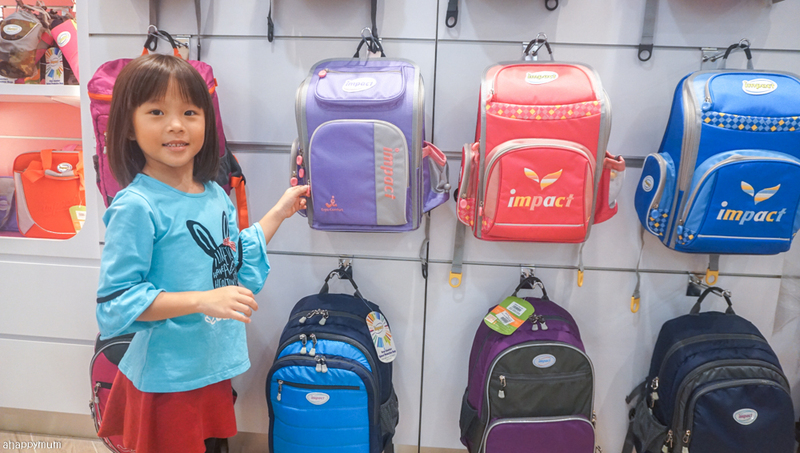 We have always believed in IMPACT school bags because this was the first brand we picked for our firstborn and it lasted us well through the years. Not only do these ergonomic school bags come in attractive colours, the designs are functional and the material is of superior quality too. Did you know? 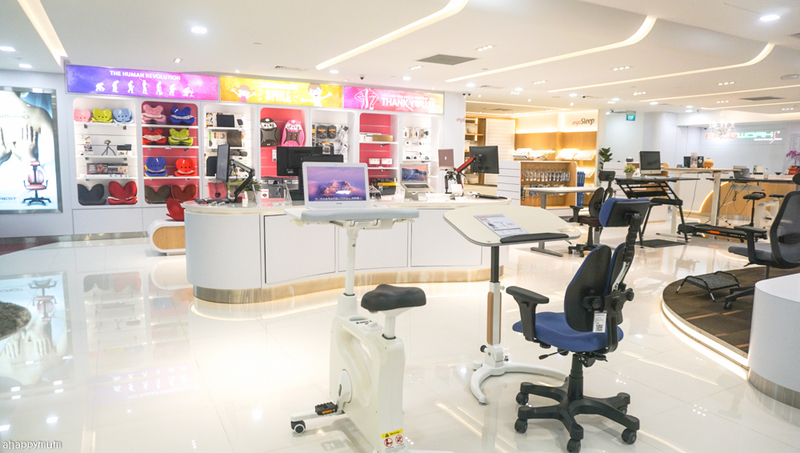 IMPACT is the only ergonomic brand internationally endorsed and recommended by Singapore Physiotherapy Association and The Chiropractic Association (Singapore), which I think says a lot about the brand itself. If you don't know yet, you can get to enjoy a 20% trade in offer with any used IMPACT bag (regardless of condition) and a 15% discount with SAFRA membership card or Cordlife Circle membership card. Note that this discount is applicable for regular priced bags only. 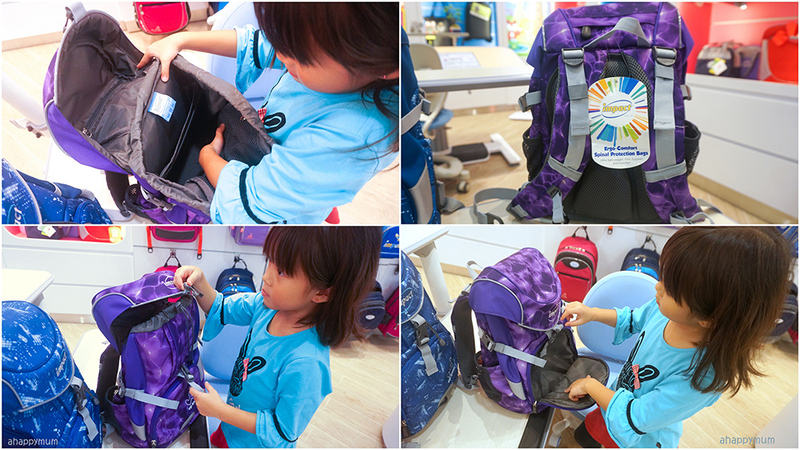 In wanting to let Ariel have the freedom in choosing her own bag, she took time to try on her preferred designs one by one. 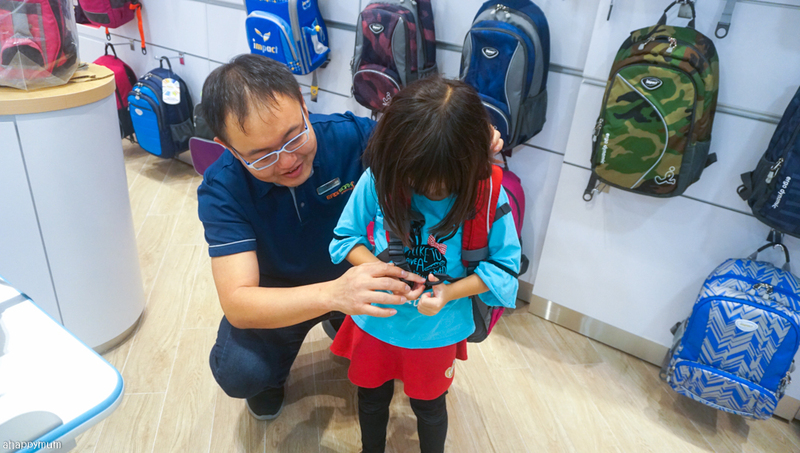 We met the assistant Sales Manager, Winston, who was very kind to let her try them on and he took the time and effort to help her adjust the belt and straps accordingly so that the bag fitted snugly every time. We learnt that the recommended weight of a school bag, complete with all the books and stationery, is around 15% of your child's body weight. I would like to keep it in this range for my kids to avoid unnecessary stress and damage to spinal health. 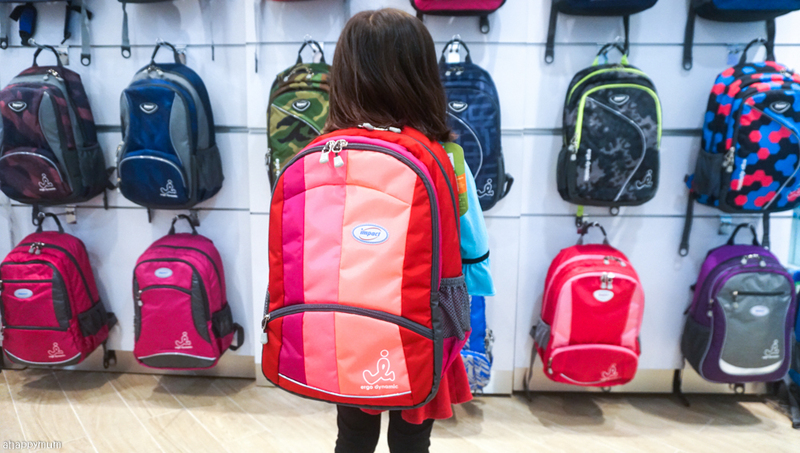 If you think about it, a school bag on average weighs around 1kg already and if you have a child who weighs around the same as Ariel (18kg), that means you need to try to reduce the load to around 2-3kg. Let me assure you that this WILL be a daunting task because primary schoolers have seriously a lot of books, worksheets, files and stationery to carry to school. The good thing is with a truly ergonomic bag like IMPACT, it is still acceptable if the weight exceeds the ideal and is a little close to 20% because the bag helps to counter the 'extra' weight and evenly distribute it. Yes, a big PHEW for me. Not all schools have in place the system where students can keep their textbooks in classrooms or provide lockers for them to deposit some of their personal belongings. This means that while it is important for the kids to learn to pack their bags according to the timetable every day, it is also equally essential that the school bag is sturdy, light, comfortable to carry and promotes better posture. Here's sharing the top three picks that Ariel chose that day and which design she decided on eventually. Weighing 900g, this was one of the lightest bags that we tried and not only was it comfortable to carry due to the soft material and chest stabilisation belt, the design - with the different shades of red and pink - was one of the more stylish ones we saw. However, the downside for us was that height of the bag (42cm) made it too long for Ariel to carry. It is recommended that the bottom of the school bag does NOT exceed beyond half of the buttocks of the child. So in this case, this was not a good fit for Ariel's petite size. This is the latest model to hit the stores and it features a patented 3D Airy Light Back-Care System to reduce stress on spine and back. We found it rather unique as compared to the rest because it comes with a buckle and drawstring instead of the usual zipper. I thought it looked pretty nice and cool on Ariel and in fact, I think this would be a good bag to bring along for any outdoor adventure too. Available in three colours - pink, blue and purple, this was definitely one of our top picks that day. The only thing to note is that the child has to be adept at the drawstring and buckle, if not it would take longer for him/her to open or close the bag. That said, I think all it takes is a bit of practice and we would strongly recommend this model too. This is the one that I will be giving away at the end of the post so you can start to think about which is your favourite colour! Ariel's last pick was a similar model that her elder sister chose three years ago when it was her turn to enter Primary One. I think the main pull factor was because this one came in such a pretty shade of purple, which happens to be her favourite colour, that many girls would find it hard to resist too. Yes, I mean just look at that sweet combination of pastel purple and pink, even I had to admit that I was attracted to it at first glance too. With the multiple organiser compartments, elastic straps, detachable waist belt and breathable material, this design has always been one of our best-loved ones throughout the years. 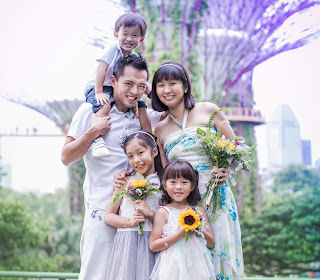 Personally, I also prefer the kids to choose a bag with a sturdy structure so that it stands upright on its own without having to lean against the table or chair. It makes it easier for the child to reach inside to retrieve the belongings or pack the bag at the end of the class, right? Can you guess which school bag she decided on in the end? Or rather, I think she already made up her mind from the start. Haha. Yes, the PURPLE one, of course! 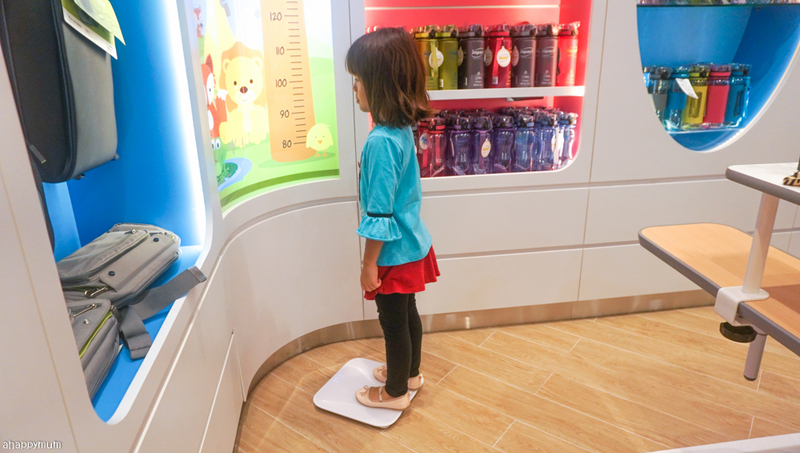 Anyway, to make it easier for parents to determine which type of ergonomic bag or furniture will suit the child most, you can also find a weighing scale and height chart inside the store too. Next, let's move on to the accessories! 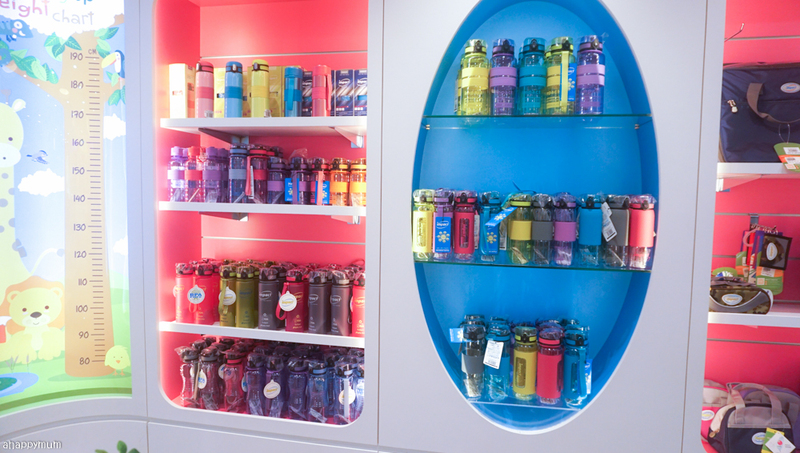 Firstly, let's talk about water bottles. I have to tell you that we have been fans of the IMPACT water bottles for the longest time and I've even bought the same ones a few times because the kids somehow lose their bottles every once in a while. The ones that we are using are the 450ml Nano Ionizer Jump Lid Water Bottle which retails at $19.90 each. Not only are they BPA free, they are also light weight, odour free, temperature resistant, heat resistant and very durable too - I can't count how many times we have dropped these bottles but they have never leaked or become spoilt. The key spring open cover also makes it easy to open and close and even my toddler is comfortable with using this bottle and does it with ease. The wide opening design also makes it easy for the girls to refill their own bottles and clean them thoroughly too. 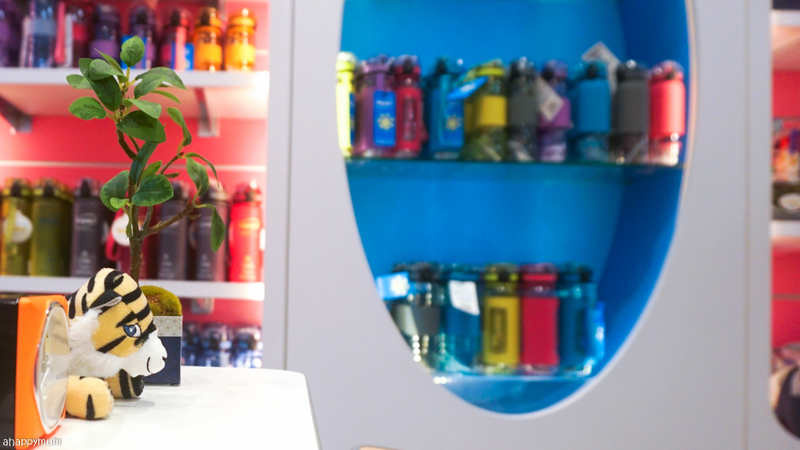 Another unique feature of the water bottles is the inbuilt nano ionizing technology, thanks to the revolutionary, high tech Tritan FDA compliant material used in making them. This technology helps in reducing water molecules, thus making it easy to absorb and increasing the capacity to promote the body's metabolism, activate cells and enhance immunity. It is recommended that you change a bottle every year or when scratches start to appear on the inside of the bottle because that is when the ionizing properties no longer work. 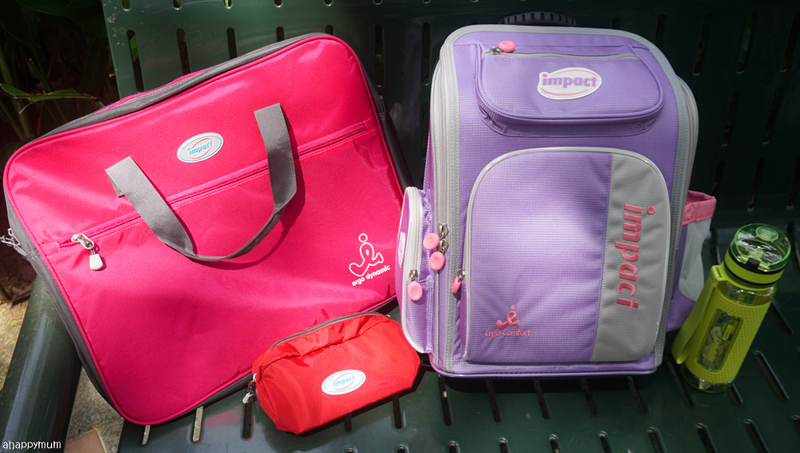 Besides water bottles, IMPACT also offers a range of quality accessory products including wallets, stationery pouches and carry bags. The stationery pouches come in simplistic, functional designs and there are four colours you can choose from - red, purple, sky blue, navy blue. I'm fully aware of how a school bag might not be sufficient to contain all the books or artwork the child might need to bring home on some days, so a carry bag such as this one below will come in handy. See how happy she looks with her new pink carry bag? Very striking, right? I guess that makes it hard for her to lose it. Haha. ERGOWORKS is now running a Purchase with Purchase promotion whereby for every purchase of an IMPACT bag, you can receive a Back to School Bundle - stationery pouch and carry bag - with a top up of $9.90 only (usual price $46.80). Minimum spend is $90 and available while stocks last. I think it's a pretty good deal and definitely value for money! With everything in place, I think she's more or less all set for Primary School! Winston showed the girls the proper sitting posture and I was very thankful for that because these girls have a tendency to fidget in their seats, slouch or just come up with the weirdest sitting positions at times. He reiterated on the importance of good postures and how this could potentially benefit our health in the long run. 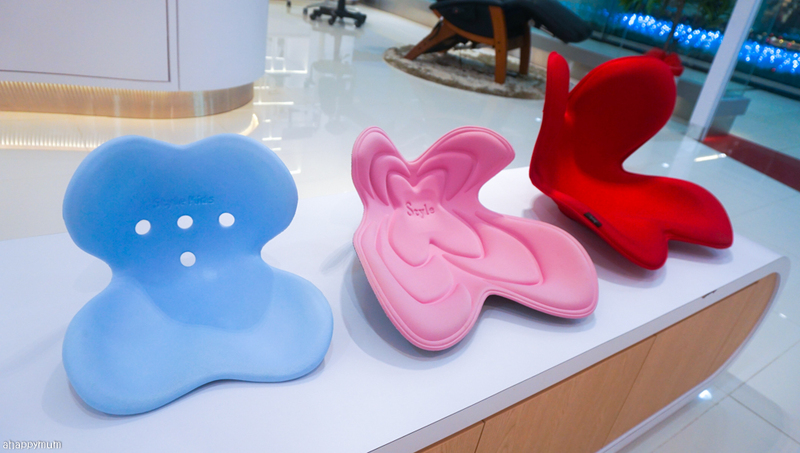 We were also introduced to the STYLE KIDS Back Support, something which I've never let the kids try before and am tempted to do so now. These unique structures wrap the pelvis to help correct postures naturally and other than sitting in it, no effort is required of the kids so they won't even realise that they are practising the right sitting positions. Growing up, I didn't have a study table or chair so my revision corner was always the sofa and a coffee table which I had to bend over in order to do any writing. Thus, when I became a mum and the kids started attending school, one of my priorities was to get a good table and chair set for them. We've been using our ergonomic tables and chairs at home for the past two years and I love how these furniture grow with the child since they are height adjustable. 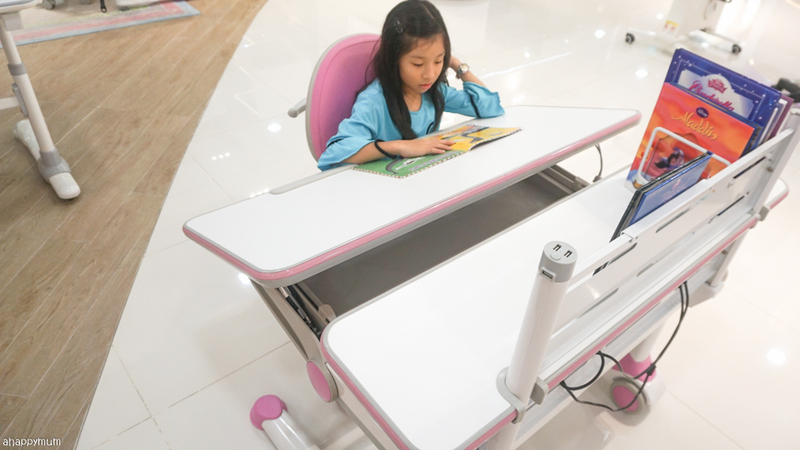 The table top can be tilted depending on whether you are using it for writing, reading or painting and the chair can be adjusted to ensure that you can getting full back support and sitting in the optimal position. 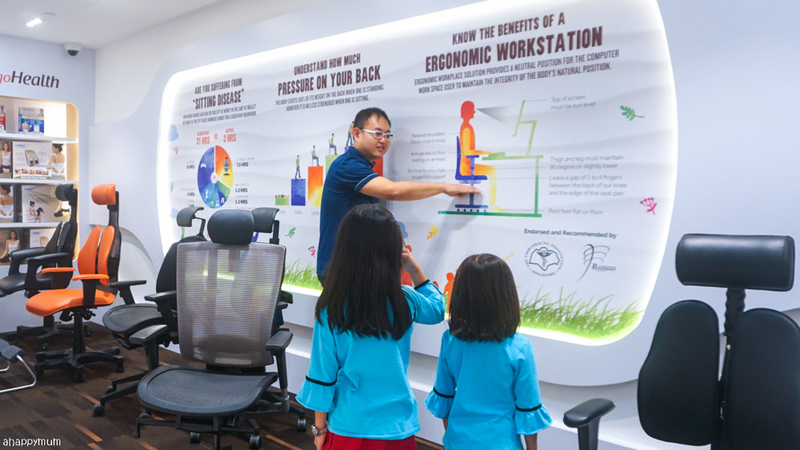 ERGOWORKS offers a variety of good quality ergonomic desk and chair sets for you to choose from, including trustworthy brands like Comta Kids, IMPACT and Ergostars. We tried out a few of them and the kids said they felt so comfortable sitting in the chairs and reading the storybooks that it was hard for me to pull them away afterwards. Well, I am hoping that having a good desk and chair will continue to motivate them to study, read more and work hard! There are several promotions going on now, including 6-in-1 bundle deals, free gifts, free local delivery and some of the sets are even retailing for less than half price! I strongly recommend that you invest in a good desk and chair set for the kids because it will bring about benefits in both the short and long runs, especially since these products are durable and can last through the years. 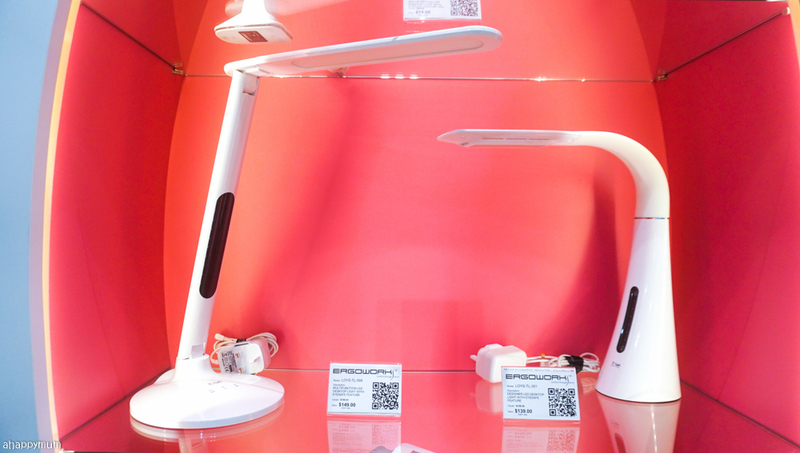 Lighting is a crucial factor when it comes to protecting our kids' eyesight and I always stress to my girls that they need to switch on their desk lamps whenever they are reading or writing. For now, we are all free from myopia and I'm keeping my fingers crossed that it can stay this way in the years to come. 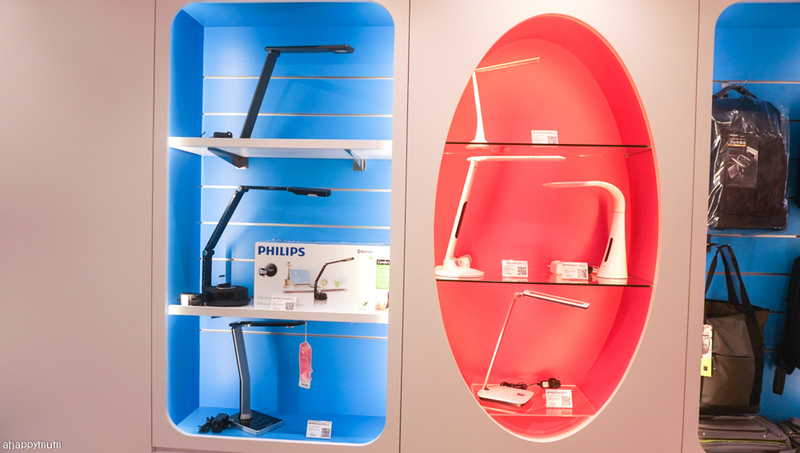 We saw a range of Philips LED table lamps being sold at affordable prices at ERGOWORKS so you can check these out too if you are looking for one. Have you heard of an ergonomic mattress before? It's the first time I came across it so I was really intrigued about how it works. 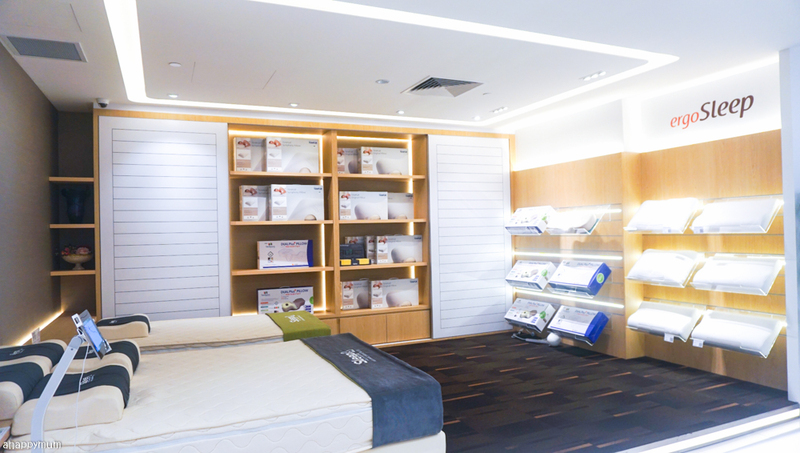 Basically, the mattress is customised and made to measure based on your height, head and shoulder measurements and designed specifically to best support the neck, shoulder, upper back, lower back and spinal cord in helping to ensure a good night's rest. It comes in kids' sizes too and this was Ariel's favourite corner of the day. Yup, she felt so comfortable lying on the organic latex mattress and said she could sleep there all day long! As one can expect, the price of these made to measure mattresses are on the high end but if you are able to afford one, perhaps it might just be the solution to more comfortable and restful nights. All in all, we had a most fun and informative shopping experience where we learnt a good deal about good postures and ergonomic solutions. Thank you, ERGOWORKS! Here's a short clip to take you around the store and show you more of our experience! Ariel brought her new IMPACT school bag out recently just so she could have a better feel of it. It's a much bigger bag as compared to her preschooler small backpack so I thought she would need a little bit of time to get used to it. She is now quite adept at opening the bag and is also excited to pack all her new books into the different compartments. Yes, see all the different compartments which will hold the books snugly? This will help to not just organise her stuff, but more importantly reduce the stress on her back by ensuring that the belongings don't bump around when she walks. Water bottle and umbrella go to the left and right pockets while wallet and house keys (yes, she is getting a set of keys just like her sister, in case she gets home herself and for some reason the door is locked) fit nicely into the front pouch. She is so in love with the whole purple colour and the pink zipper sliders too, and I am happy just to see that she is happy. This little girl is definitely most pleased with her new school bag too and I have no doubt that it makes her feel excited and ready to embark on her Primary School journey soon. Woohoo, let's bring it on! I know many of you have been waiting for this, so here's your chance at bringing home a brand new IMPACT school bag! I am giving away not one, but TWO IMPACT ergonomic bags IPEG-226 and you can choose your desired colour (pink/blue/purple) too. This is the latest design and I personally think that it looks aesthetically pleasing and seemingly less bulky because of the soft material and drawstring opening. I will be choosing two winners randomly, one from Facebook and the other from Instagram. 1) Leave a blog comment in this post to qualify. 2) Like A Happy Mum and ERGOWORKS on Facebook. 3) Like my post and leave a FB comment on why you would like to get a new school bag, tagging three friends who might love to win too. 4) For a bonus chance to win, share this post with your family and friends. 4) Tag as many friends as you can, one in each comment. The more you tag, the higher your chances of winning. 5) For 5 bonus entries, repost my post and tag me and #ahappymumgiveaway. It is mandatory to complete steps 1-3 for FB and steps 1-4 for IG to qualify for each of them. You can choose to join either of the giveaways or BOTH to double your chances of winning. The giveaway ends on 25 Nov 2359hrs. Two winners will be chosen and contacted via DM, they will have to reply within 48 hours or new winners will be picked. This giveaway is open to all readers residing in Singapore and aged 18 and above. It is in no means endorsed, administered or affiliated with Facebook or Instagram. Best of luck, people! Disclosure: This is a sponsored collaboration with ERGOWORKS. All opinions are our own. They are growing up too fast don’t they!! Ariel looks so ready for P1!! Hope to win for my boy. Good choice, Ariel! I love the colour! 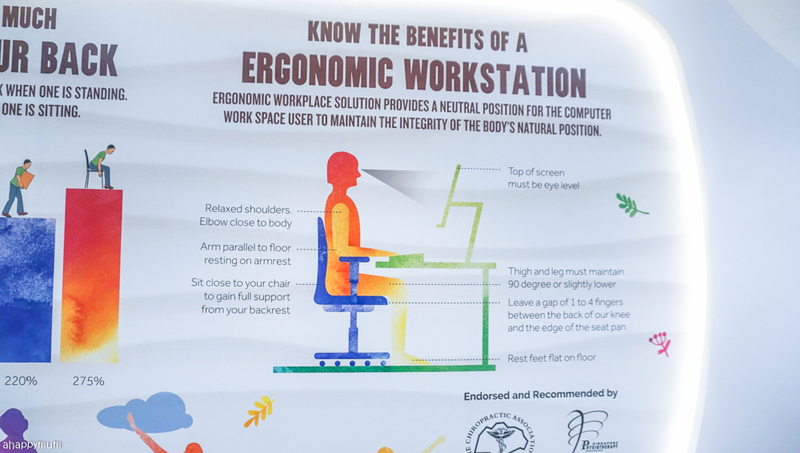 Love Ergoworks's extensive range of high quality, comfortable and user-friendly ergonomic products, which is renowed for its functional features and health benefits. They provide total wellness and comfort to a diverse range of users across all age groups who desire for maximum care for their body structure and posture. Hope to win as it will be a great Christmas gift for my son. Hope to win one for my small build boy who is going to Pri 1 next year. Having a good bag to support his back is so important. Imagine the heavy books that he carry to sch, I wonder if he can handle or nt. My girl will be entering primary one next year too ! Really hope to win this bag for her!! I would love to win this bag for my son. It is good for his spine and kids bone is still growing and carrying a heavy bag can affect his spine growth. Wow love your great introduction and the selection is so cool. Please let me win it for my son who is entering prinary one next year. Thank you for the detailed write up. It definitely helps me understand more in prepping my first born for P1 next year. Hope to win this bag for a Christmas gift to kick-start 2019! Like the IMPACT ergonomic bag as I believe it will help lessen the stress of my son’s spine while he carying his school bag while climbing up the school staircases. Having a good support bag is important for their postures and also help in their overall development at these ages. My son had used impact brand bag for 3.5 yrs. I find the quality is excellent. Wah time passes so fast she will be PR1 in 2019.hope to win for her as a Christmas birthday and a wonderful start for her 2019. A new start for her .Hope she can handle ..
Love good support bag for my girl. As it provides spinal support for them. Most importantly must be of a good pricing too. 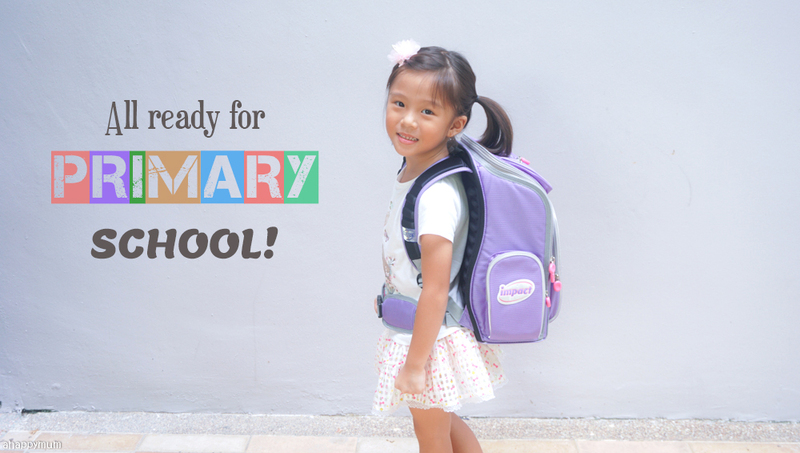 Naughty 2 (like Ariel), is going Primary school too! 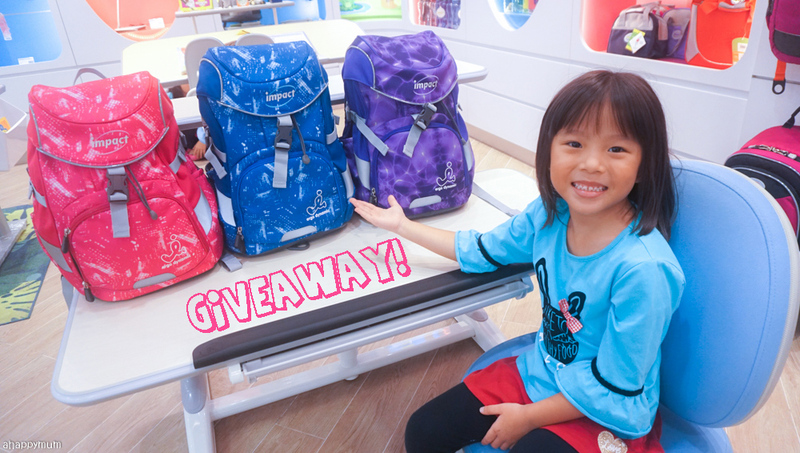 Hope to win her a pretty bag so she can heng heng go to school with all the luck the bag brings! Oh I really hope to win one of this! Like you, I'm unable to help my elder boy with carrying his bag. I so wanna win this! Great write up! Gained some knowledge as I did not know there's ergonomic mattress too! The bag awesome and it's best suited for my boy in Primary two next year! Hope to win! Thank you for coming up with a detailed blog on this ergonomic bag, ideal sitting posture and good lighting to prepare schooling kids! Hopefully I can win one for my nephew so that he doesn't suffer the same spinal issues as my younger sister when such bags or information were not easily available probably 30 years back. Hope to win this for my boy who is going primary school in 1 year's time. He is only 13kg so hope the bag can help with the load distribution of the books. These bags r great and ergo . Good for the backs. My boy is tall and is often seen hunching when he walks. With formal education coming along, i am sure his school bag is going to be heavy and may aggravate the situation. Hope to win a bag for him! Will definitely ease his back problem. Primary school kids bag are really heavy.They need a good bag like this to support their back but not damage their back.So many colours to choose. Love it. This bag is good for back posture. Hope to win this for my son as his school bag is spoil.My hubby is the sole breadwinner of our family. We just visited their shop last month! Our eldest is off to P1 next year and it is definitely the bag we are going to buy. This giveaway comes in timely. Thanks for the very detailed comparison of the different bags and accessories. Saves us wandering time in the shop. Hope to win. Thank you!! My daughter has a small body frame and I noticed she is slouching. This awesome bag sure comes very handy for her to bring the books to school. I would like to win this for my niece who is going for Primary 1 soon! 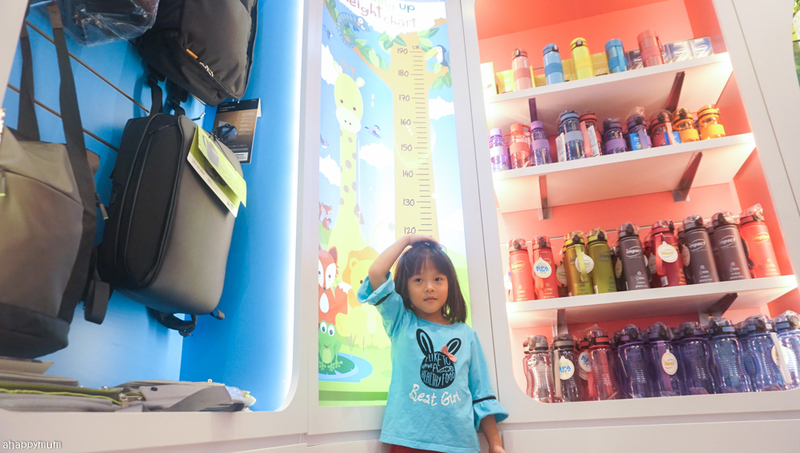 Was thinking to buy an ergonomic school bag for her. Hope to win this for her! I have 4 girls, of which 2 are in primary school. The eldest girl has been using her school bag for 3 years. Though the bag its still in ok condition and my girl is not pestering me for a new bag, I hope to reward her for her efforts put in her latest exams. Nope, she did not excel in her grades but I wish to motivate her to work harder for next year when she carries her new school bag to school next year! Hi A Happy Mum, may I ask this the bag machine washable? Thanks. I would love to have the pink one for myself & the blue one for my boy. As always, thank you for organising this giveaway. Thanks for organizing this giveaway and such a detailed writeup! i would like to win this for my child. This is such an interesting & detailed write up! Thanks for providing so much insights on the importance of choosing a suitable bag so that it won't over strain the child. Maintaining a correct posture is vital to have a good overall spinal health. Thank you for introducing Ergoworks and the wide range of other products they have to offer. Wow so many designs to choose from! Thanks for the review. The bag looks like a good fit for a 7yo. It doesn’t hang down and sits nicely on the shoulders. Support is so impt - feel so sorry for the p1s carrying heavy school bags! Impact bag looks so stylish! Hope I have the luck to win one for my gal who is P6 next year. With more books in P6, hope Impact can let her carry the bag as ease. I hope to win the purple colored bag as well as it is my daughter’s favorite color too. Thank you for this great opportunity! have back prob due to carrying kids and it can really affext my daily routine. So I hope to win this bag for my first born who is entering P1 next year to protect her back and spine. We just went for orientation and I am glad that she was excited(homeschooled her presch yrs) for school. This is her very first time attending formal school and a big milestonen for us too. Wish us luck! My boy will be in K2 in January. 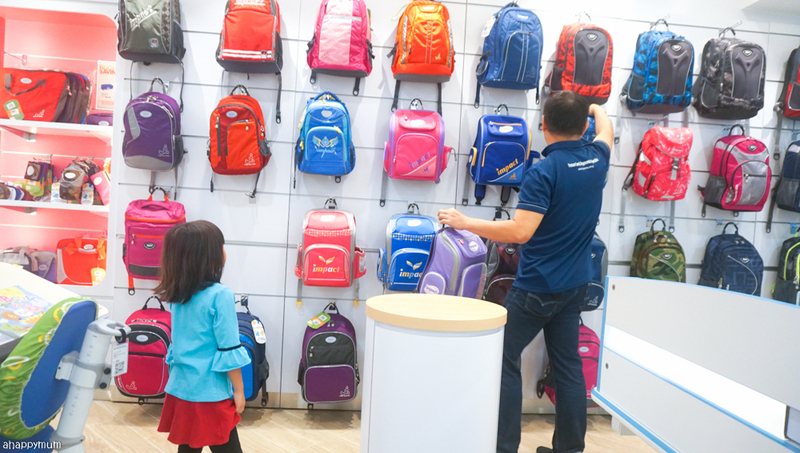 Moving up, kids now have more things inside their school bag. 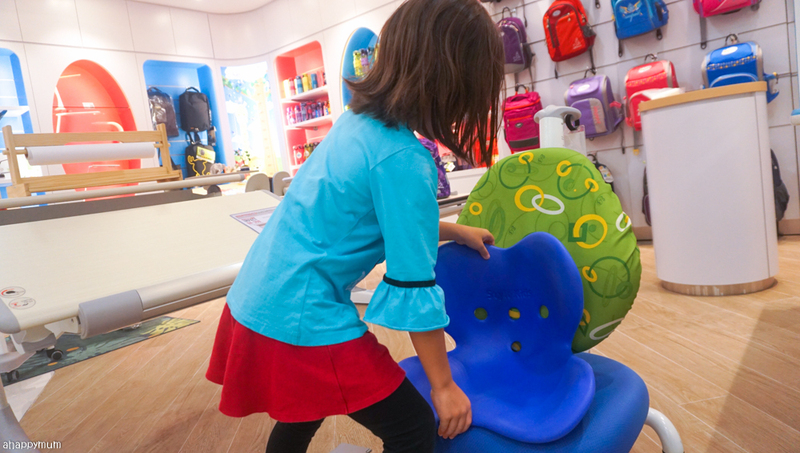 Ergonomic is important to preserve kids' good posture. Hope to win the bag for my preschooler. 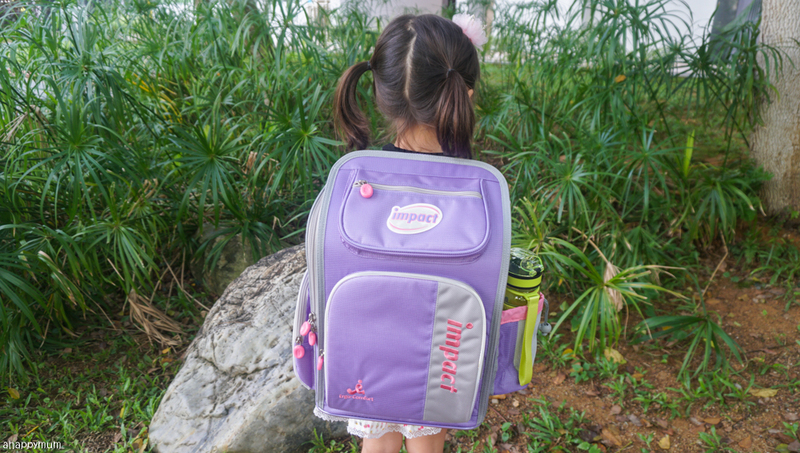 Been looking for a school bag that suit my small build gal (only 15kg) and come across ahappymum blog recommending ergoworks impact series. 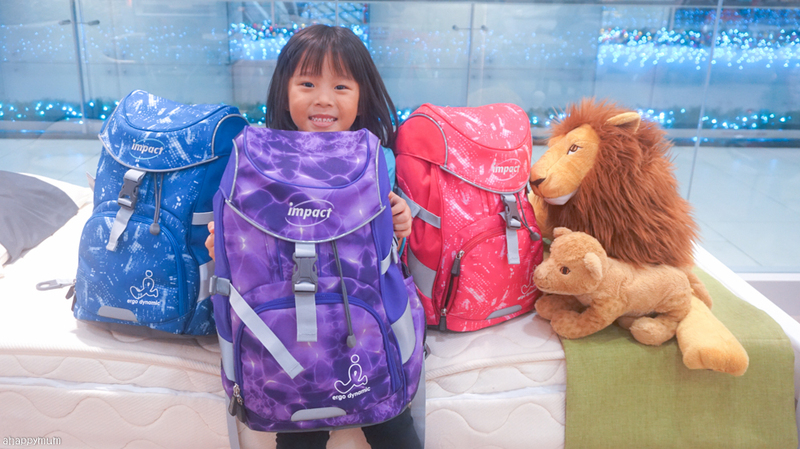 Looking thru the reviews and impact series have a good spinal support for our growing kids. Further assurance for parents like myself with the endrosement and recommendation by both SG physo assoc and the chiropractic assoc (SG). Definitely, impact by #ergoworks will be the choose for us. 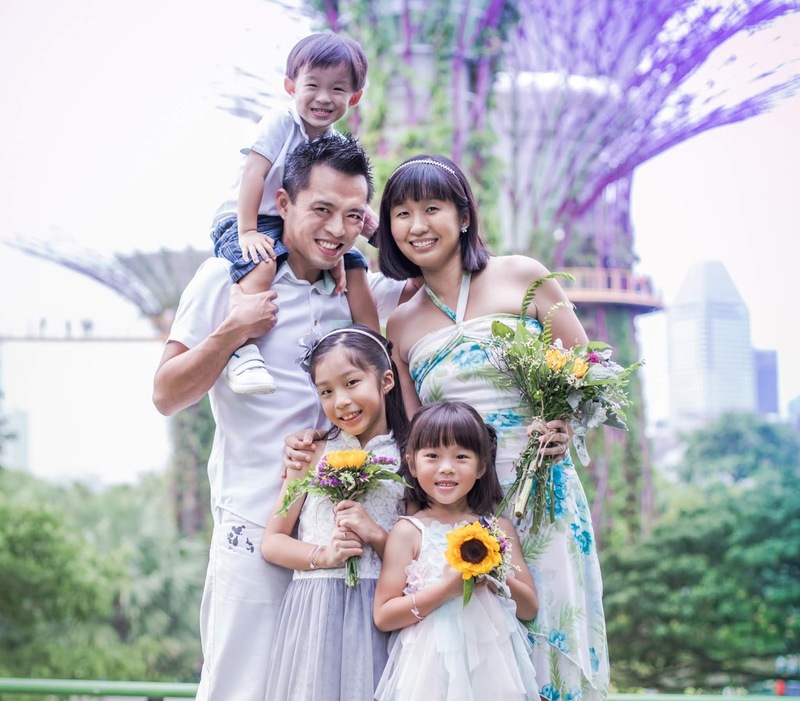 Thanks for the #ahappymum reviews that helps parents to make impt choice for our little angels. All the best to Ariel for P1. My daughter will be starting P1 too!!! Thanks for the detailed write up. I m thinking of getting the backrest seat to correct my girl's sitting posture. Would love to win the blue colour backpack. Thanks. 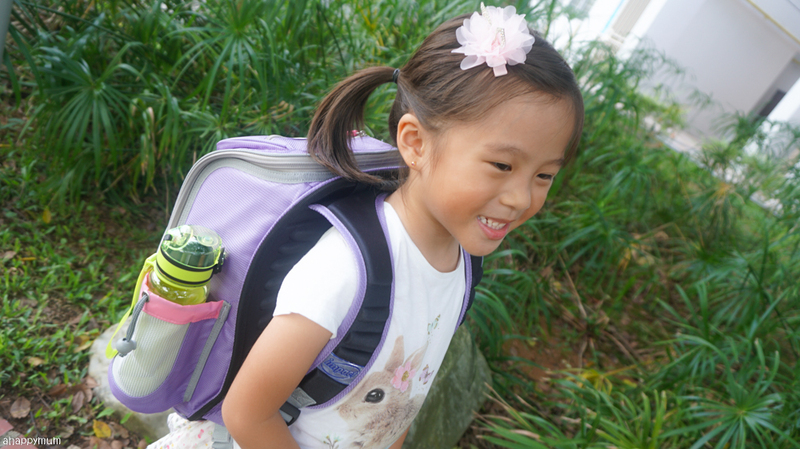 I know this is a very good brand with spiner posture school bag specially for primary kids. Would wish to have it for my primary girl. Wish our dream come true. Love the detailed write up! I am glad to know there are many items that can help to support the growth of a child! Fingers crossed for such a good contest prize!! 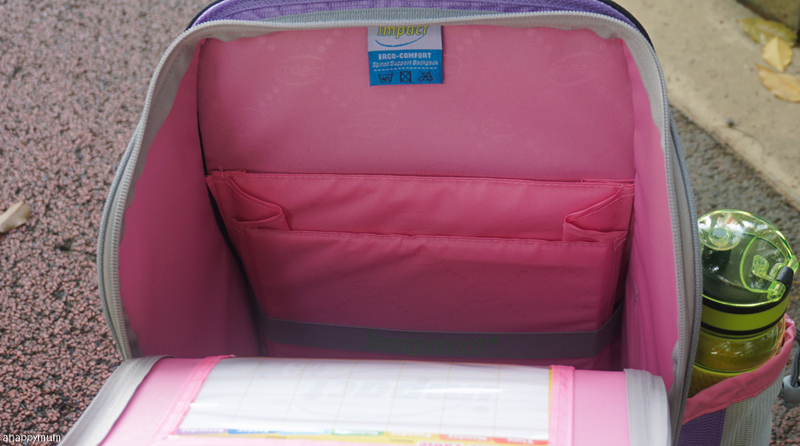 The bag would come in so handy for my girls to carry to school without hurting their small back frames. Thanks for the giveaway. My daughter is entering Primary One next year. She loves pretty bags. I hope to win one pretty and functional bag for her. Hope to win this as my boy's current bag is too big on his small frame. Hope to get one suitable for him. Hope to win for my boy or my daughter. Hope to win the bag for my boy who is entering P1 next year. He will love the bag for sure..so comfortable and nice!! My girl is going to P1 next year and she is looking forward for a new bag. My mum bought an Ergoworks chair for me years ago, and it really helps. 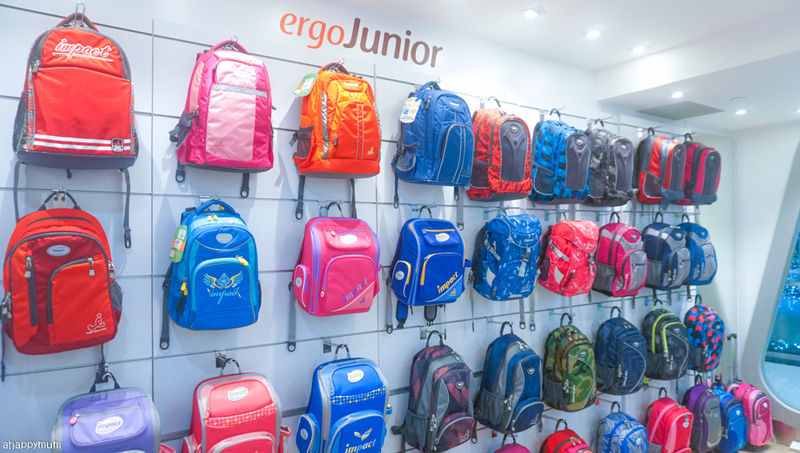 So, I know Ergoworks products do help with posture, and I hope I can win this new bag for my son! Thanks to Ergoworks for these wonderful products that take care of our kids !! Their bags are very functional and lovely!!! I very much adore these bags... thanks the organiser for this giveaway. I would like to win a excellent lightweight blue for my boy next year P4,to support his back to fro school. Currently his bag weights like carry a bookshelf to school. As Christmas is fast approaching and it's the spirit of giving, thx Ergoworks for the generosity! Hope to win a new bag for my thirdborn. My daughter is going into P1 next year too, and I was searching for what kind of bag to get her, which is how I can across this post. Very useful indeed, it gave me a clearer picture of what to look for, thank you! Would love to get the blue IPEG-226 (so that either my daughter OR my son can use it, though I myself an leaning towards the purple as that is my favourite colour, lol) but I kinda like the one Ariel chose in the end (my daughter is petite too! ), so I might check that out for myself in stores this weekend! Hope to win a new bag for my son as he embarks on a new milestone in his life. P1 next year. Been heard alot of good reviews on the bag, lightweight,good quality and big compartments inside neater for book and files. Hope to win for my boy a good support for bag. Thank you for the giveaway & have liked and shared this awesome giveaway with buddies. Hope to win for my boy entering Primary 1 too!! Totally agreed that a good bag is worth the investment. I have slipped disc before and totally understand the importance of taking care of the back and taking care start from young. Hope to win for my daughter who is going to Pri 2 next year. I hope to win for my 12 years old daughter. Next year she will be in secondary school! I want to reward her with more practical thing. She has reach another chapter of her school life. Mummy wants to give her a pat on her back for the good results she has achieved!